My first birth was in a hospital, and was a routine nightmare. I was totally unprepared, and expected the hospital staff to deliver the baby for me. Nothing really went wrong except that I did not know what was normal to start with, and I was alone, I finally delivered my baby and she was really beautiful. I tried to forget the whole experience of labour and just got to know my baby. Four years later I become pregnant again, but realized I had not forgotten one second of my last labour. I was visiting a friend one day and told her how terrified I was of going through another experience like the last one. She gave me a book to read which she thought might help. It was Commonsense Childbirth by Lester Hazell. I was amazed reading it. For the first time I realized that I had had a normal easy delivery that first time, that the only thing holding my body back had been my lack of knowledge about birth and my unwillingness to do anything for myself. Although I planned a home birth with my second, it was unfeasible at the time, so I went to the hospital. Both the labour and birth were fast and efficient. The only problem was refusing interventions from the staff. During my second pregnancy, I developed a real interest in pregnancy and birth. I had read everything that I could find, and later decided to take nursing so I could work in obstetrics. It was during this course that I met Sandy. We had absolutely nothing in common except our interest in birth, but became good friends who argued a lot anyway. When I became pregnant the third time, I knew I wanted a home birth. Although we were both very inexperienced with actual births, Sandy agreed to help as midwife. The doctor I was seeing was really understanding of my needs, but disagreed with having the baby at home. He offered to let me do anything I wanted during the birth, if only I would come to the hospital. This really made the decision hard. My husband, Sandy and I all discussed going to the hospital, and reluctantly agreed that maybe it was the best idea. We were all sitting around, really depressed about it, and I finally realized that no matter how wonderful the hospital sounded, I really just wanted to be at home. The labour was uneventful except for a long latent phase. Transition was probably the hardest I had experienced, but I felt confident all the way through. The birth was wonderful, and has to be the peak experience of my life. A few years later I met another woman who was planning a home birth, and actually had a doctor who would attend. I was elated. I met Ben Toane, who was looking for a few nurses to help at home deliveries. I phoned Sandy, told her to move back to the city, and we have been doing home births ever since. We feel very fortunate to be doing these births, as very few people are lucky enough to work at something as important as these births are to us. After working with Dr. Toane for two and a half years, the College of Physicians and Surgeons passed a ruling prohibiting doctors from attending home births. After considerable thought, Sandy and I decided that we would continue to attend births, even without a doctor present. We felt that home birth was an alternative many couples needed, and we would support it in any way we could. We have been working and learning ever since and are grateful that we have the opportunity to work with couples to help them make their births happy experiences. Noreen Walker when she graduated nursing from Grant MacEwan in 1974. 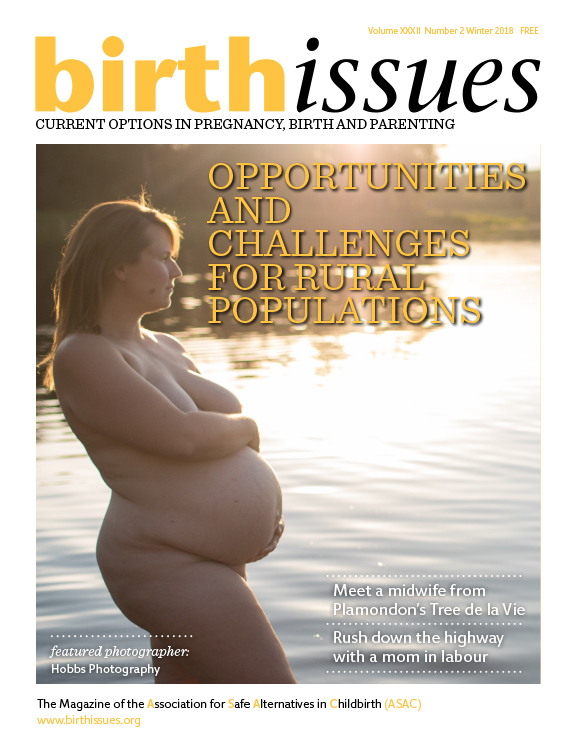 It is hard to look back on the last 20 years of home birth and midwifery in Alberta without a great sense of pride for what we have accomplished, and a sense of regret that the job is not over yet. Time seems to have helped me forget a lot of the early struggle and embellished the positives of our early years. I think of the 80s as the glory days of midwifery. We were so excited about birth, we were busy (clients could still afford our meager prices), and we were in great demand for public speaking. Our consumer movement (ASAC) was extremely active and very supportive. By the end of the 80s the time seemed right to bring midwifery into the mmainstream with legal recognition and public funding of midwifery. If the 80s were our glory days, the 90s must be our manic-depressive stage. We have had some great highs, but also some monumental lows. In 1990, while the Health Disciplines Board was investigating the possibility of regulating midwifery, I was charged with practicing medicine without a license. This rallied our consumer support to even greater heights, and we were all elated when the charges were dismissed. We felt like David must have after he slew Goliath. The underdog can win. 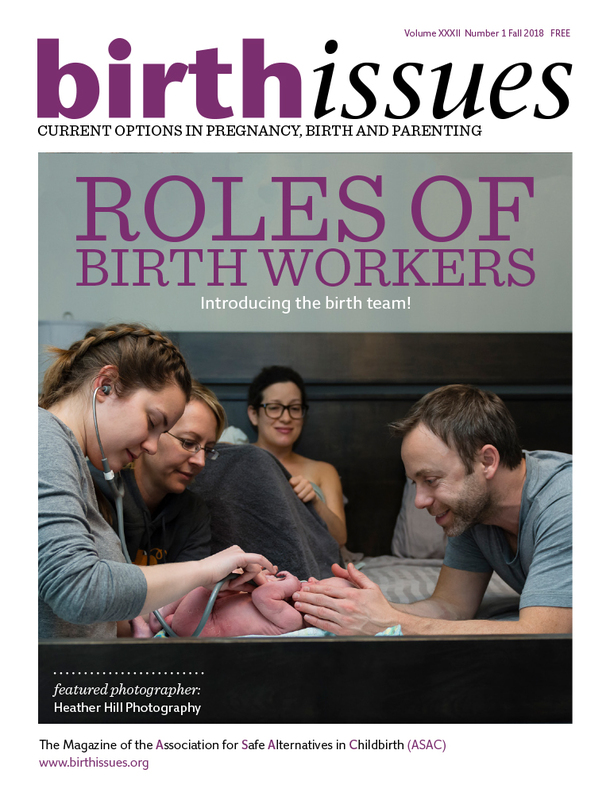 When the Health Disciplines Board announced the day after the trial ended that midwifery would be a licensed, publicly funded profession in Alberta, we felt that the battle had been won, and within a few short years all our dreams would be realized. Everyone sighed with relief, and went on with their lives. The committee work that set our standards and regulations dragged on for years. Government changed and set up regional health authorities, and with that change our promise for funding was lost, although we were blissfully unaware of it at the time. We continued to attend births, but were all now extremely busy donating our ‘free’ time to sitting on committees and preparing for the midwifery exams. Moral was reaching a new low. Other provinces were passing all our efforts and Ontario and BC both received funding for midwifery. Our consumer movement was dwindling, most of them under the impression that it was a done deal. The few committed individuals left were working extremely hard, but there seemed to be no options left to approach the government for funding. Although the support for midwifery was there, Alberta Health insisted it be up to the RHAs to fund us in their budgets and the RHAs insisted that they could not fund us until Alberta Health increased their budgets. We felt trapped in the middle, but we decided to carry on with the belief that funding would somehow happen. Surely the government would not spend the huge amounts of money to form all these committees and set up our exams and then not carry through without fully implementing us into the system with funding? We wrote our exams in the summer of 1996, but still had to wait until July of 1998 to be officially recognized. We were becoming very aware of the snail’s pace at which any government project happened. I ‘joked’ with other midwives that government could take a task that would take one person one day to complete, then form a committee to do the work, and it would take at least a month for each member on the committee to get the job done. I think I was too kind. Registration has been a double-edged sword. We have some advantages in that we can now provide complete care and order lab and diagnostic tests, but we still do not hae funding or hospital privileges. The stress of the process has been too great for many midwives. Last year we had ten midwives practicing in Edmonton, now we have only four. Some have left for greener pastures to funded provinces, and some have decided to move on with their lives in different jobs. The midwifery program at the University of Alberta that was approved and ready to start last fall has been put on hold until there is government funding. We expect fewer midwives to register next year because of the costs of registration and malpractices insurance. We may be left with too few midwives to run our association and governing body. My hope for the next twenty years is that the pendulum swings back to glory days and we can achieve the goal of funding.